It was a small item tucked in the middle of the list of new assignments for priests released by the Philadelphia Archdiocese on May 16. 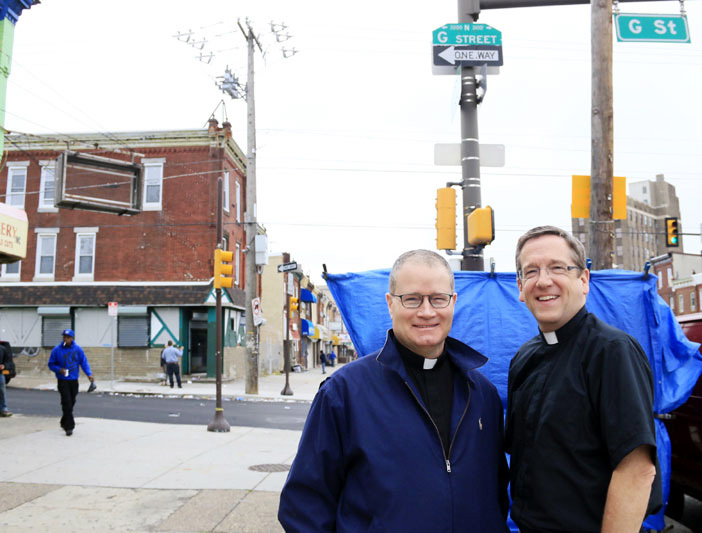 Under Special Ministry, Father Joseph P. Devlin, pastor of St. Bridget Parish in Philadelphia and Father William S. Murphy, pastor of Assumption B.V.M. 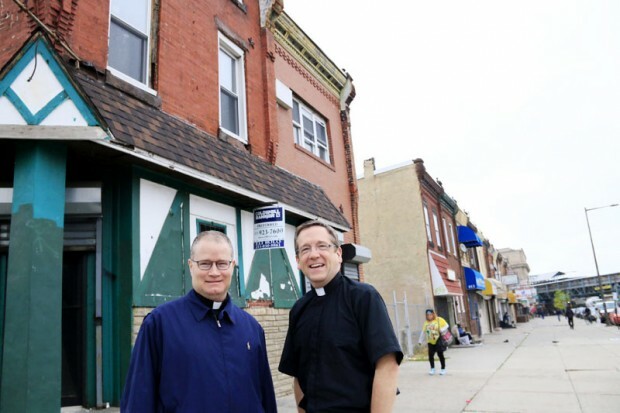 Parish in West Grove, were reassigned as co-coordinators of Mother of Mercy House in the Kensington section of Philadelphia. A quick check of the Catholic Directory of the Archdiocese of Philadelphia shows no such place as Mother of Mercy House and for good reason. It will not come into being until June 15, when Fathers Devlin and Murphy take up their new ministry. You could call it a store-front church, but that is not exactly correct. In the first place it is not a parish; that area is part of sprawling Holy Innocents Parish. And truth to tell, its 801-03 East Allegheny Avenue address was not a store. In more prosperous times it was McGee’s, a thriving neighborhood bar; it was also a word play on the location at the intersection of G Street and Allegheny Avenue. 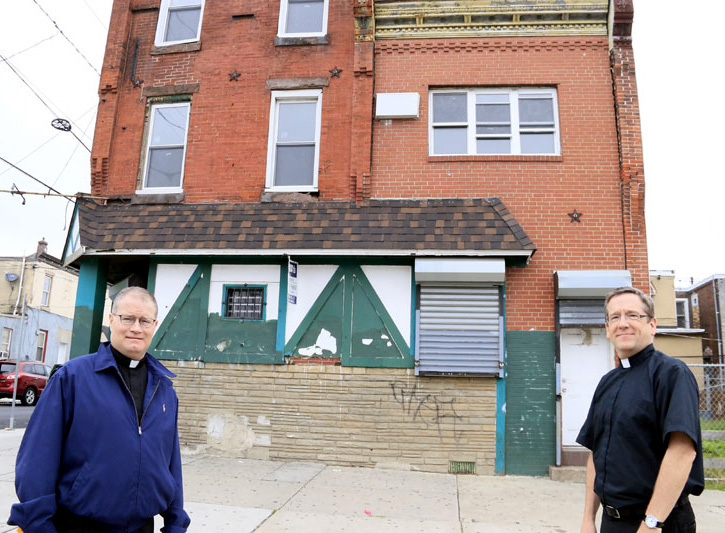 “The mission of Mother of Mercy House, a mission of the Archdiocese of Philadelphia, is to enhance the presence of the Church through a new outreach to the Kensington and Allegheny (K & A) neighborhood by establishing small ecclesial communities (block churches) formed by Word and Sacrament, forming lay leaders and by serving the neighborhood through the corporal works of mercy. As a bit of background, Kensington, which traces back to the early 19th century, was historically a working class neighborhood primarily in the textile industries. The earliest workers were English but over time Irish Catholics became the dominant ethnic group, which of course brought churches, among them the huge Ascension Church at Westmoreland and F Streets. By mid-20th century the neighborhood began to change as the mills, which were its life blood, gradually closed or relocated to such places as the southern states and eventually China in search of cheap labor. Most of the workers also moved away, and with rampant unemployment as often happens in such neighborhoods, today’s Kensington while more ethnically diverse has become became a center for poverty. With poverty comes the despair that leads to crime, substance abuse and other social Ills. In 2012 Ascension Parish, whose dwindling congregation worshiped in a huge church in need of daunting repairs, closed. At the May convocation of priests held that year in Hershey, Pa., Archbishop Charles Chaput brought up the problem of serving the remaining Catholics in parishes like Ascension where much of the energy was being spent on keeping up buildings that were no longer needed. He challenged his priests to come up with solutions. Independent of each other, both Father Devlin and Father Murphy immediately volunteered to minister in the area. Now three years later, their request has been granted and temporarily until Mother of Mercy House is ready for occupancy, they will be living in the convent of the former St. Joan of Arc Parish. Actually there is already a continued presence of the church in a more modest way. At Holy Innocents Parish, which has had to absorb Ascension as well as neighboring Mater Dolorosa, St. Joachim and St. Joan of Arc parishes through mergers, Father Thomas Higgins sends a bus every Sunday into Kensington to pick up parishioners who might not have other means to reach his church. 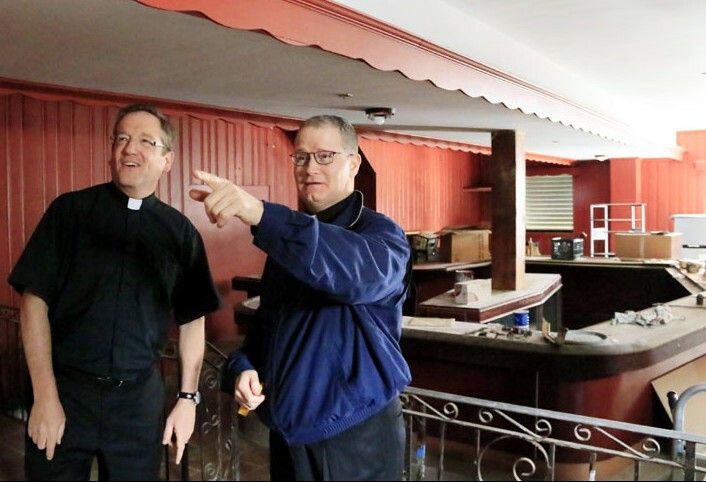 Also there is a Catholic presence in the neighborhoods through such programs as the Franciscan-run St. Francis Inn on Kensington Avenue and the Welcome Center, run by the Sisters of St. Joseph, on Allegheny Avenue, among others. They present the Gospel of Jesus Christ with Christian compassion primarily through social outreach and are conducted by religious congregations independent of the archdiocese. Mother of Mercy House will be unique in that it will be led by diocesan priests, and while not a parish, pastoral care will be equally emphasized with programs that meet material needs. Father Murphy, how wonderful that you have stepped up for this challenge along with Fr. Devlin. At St. Pat’s, we saw your amazing energy in giving people just what they needed in God’s big plan, and know that you are the perfect person for this role! May God bless you and all those you encounter! Dear father William Murphy my prayer to you. It’s really nice to see after so many years you celebrated my marriage when you were in Barceloneta P.R wish I could go see you with my husband and younger son. Father Murphy, May you be blessed for the work you chose. This is truly the mission that is needed today. God bless you and Fr. Devlin and keep you in the palm of His hand. My prayers will include your health, safety, and success in introducing Jesus in lives that have long waited for you. The above email address is new. We wish you and Fr. Devlin the best of luck and we pray regularly for your success.